We like to give the kids' teachers gifts at the end of the year. Well gifts don't have to be expensive to show how much you appreciate them! This year we decided to give the teachers and bus driver a flower! 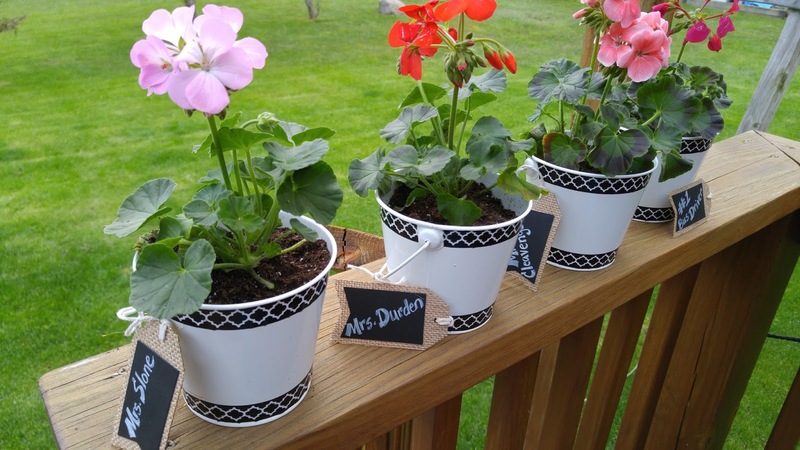 We headed over to Home Depot and picked up Geraniums in small square pots for $.88 each! Then at Target they have cute white pails,burlap labels (4pack), white markers and washi tape all for for $1 each! You can also pick up some cute tins at the dollar spot at Target. It only took one roll of the washi tape to go around all four pots (top and bottom). There was even a lot left over to use on another crafting project. It helped take a blah white pail into a chic pot! Write the teacher and bus driver names on the tag with the white marker. It may take two coats to get it looking perfect! You may need to add a little extra dirt if you have it on hand. Add a fun little Thank You note, like "Thanks for Helping Me Grow this Year". Not bad for $2.45 each (I did not factor in marker as it was barely used)!